I have a Bally Special Force and a Williams Black Knight, on each machine a few of the screw posts that screw directly into the playfield have stripped screw holes and therefore cannot be tightened. What is the proper way to repair this? 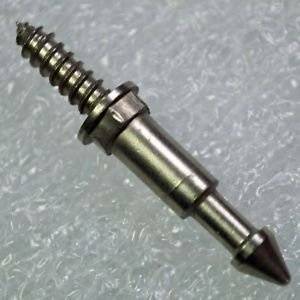 I attached a picture of the type of screw post I'm referring to. I break off a wooden match into the whole then screw the screw in. Or if the backside is clear you can get a post that goes through the playfield and has a nut on the back. If you plug the hole with wood be sure to glue it in. Screws like that are a common occurrence at my work and if they are not glued in they will not hold long. I recently had a pop bumper mounting hole stripped on my Monte Carlo EM. I considered travish 's recommendation but the nut would have interfered with the pop's center mechanism. I wood-filled the hole, drilled a new pilot hole, and was good to go. Great suggestion - also make sure to use a heavy duty epoxy (like the wood stick stuff) for the filler if it’s a post that gets a lot of hits from the ball. Chop stick works great also. That's what we use at work. Lady always looks at me funny everytime I go and get 4 or 5 sets of chopsticks then eat with a fork. I found that leaving the glue set-up overnight worked best.